Do I REALLY need to install this app on my phone? These days, it’s easy to get overwhelmed with the digital world - ‘technology tiredness’. Information constantly comes from all directions, telling you to ‘post this’ or ‘install that’. Care - we care about your valuable time, providing you with concise information for when you’re ready to input. Empower - we want our clients to understand and use their financial reports so they can make informed business decisions in real time. Most bookkeepers overload you with instructions on what to do and how to do it. We work to make your life easier because we’re willing to do for you what others won’t. We do all the hard yards for you. We proactively get you the information you need so that you don’t have to. We update this information regularly. We present it in a way that makes your choices clear and simple. All aVers clients will receive a reminder email once a week to log in to your iBookkeep App. Once in the app, you will be prompted to answer a series of questions. You can enter your responses quickly and easily, ensuring the aVers team is always up-to-date. Place the app on your home screen as you’re going to use it a lot. When using the app, your email and password will allow you to access the system. You need to enter the password only once - later the system will recognise you and conveniently log you in automatically. If you have any trouble logging in, please contact our office: 1300 255 337 or use the chat box on the right hand side. Main menu. Allows you to change companies (if you own more than one) and log out. Information/Instructions from the aVers Bookkeeping Team; quick personalised notes, related to your file. Usually contains a list of documents that you don't need to send us, as we’re already receiving copies from your suppliers. Enquiry 1: Question about one of the documents you’ve submitted. By tapping on the image you can get a full screen preview of the document. Enquiry 2: General question, usually related to a recent conversation. A reminder for you. Enquiry 3: Bank transaction related question. Contains complete details from the bank statement, so you don't need to double check your bank app. Take a photo of a document. History of the documents submitted to aVers across all platforms. Library - upload a photo from your phone/tablet's photo library. - Questions related to a submitted document. Our efficiency depends on the quality and timeliness of your answers. Lay your receipt on a flat, non-reflective surface and hold the camera directly above it. Check that the receipt is in focus and not blurry. If you take the photo on an angle it can blur out part of the receipt. Please make sure that the photo is straight. Circle the date of purchase with a pen - that can be your mark to show that you have sent it already and don't need to send it again. For security reasons, do not take images of sensitive information such as credit cards and personal identification (such as a passport). Take the picture in a well-lit area or turn on your flash. If you’re using categories, specify in the comments: eg This expense belongs to Tracking Code "Store#1"
If you have meals with clients, please specify number of clients and employees of your company: eg "2 people attended this meal, myself & 1 Client"
Please make sure that all of the receipt is in the picture - important information can be at the very top or bottom of it. When you need to take a picture of a multi-page document, please make sure that page numbers are included. It’s important to take the pictures in reverse order, ie 3, 2, 1. Tax receipts - include a clear ABN, GST, date, type of product/service. Please, do NOT send us eftpos dockets. Comments are an immense time saver, especially for unusual expenses. If you have multiple accounts, please note the account that it’s paid from. Please do not send duplicates! Please, don’t take photos of your monitor screen or send screenshots. Ask suppliers to CC your bookkeeper. A "No Invoice, No Payment" Policy is proven to give you extra power in negotiations and significantly improve your cash flow. Ask your suppliers to send copies of all invoices and statements to company-bills@avers.com.au. The is no better time to keep your suppliers accountable than before you pay them. 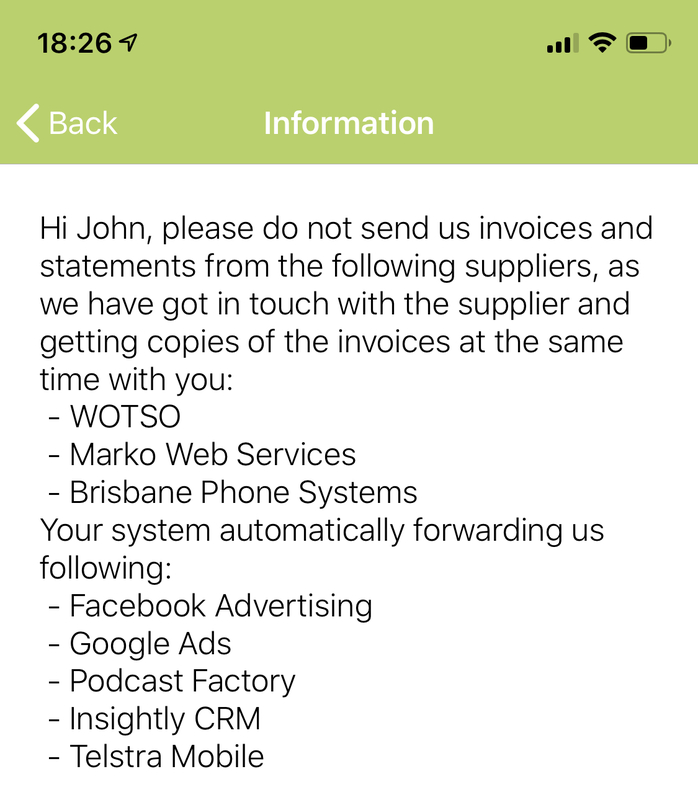 Even if they send an invoice to you, your accounts payables need to have a copy of it. This will not only give you extra leverage, but will allow you to plan your payments. It’s our responsibility to make your life easier. Automation can help us to achieve this together as a team by providing you with the information to take control of your cash flow. But we need your help to make this happen. We as your bookkeepers are happy to establish direct communication with your suppliers, giving 100% of the control back to you. Are you still paying people who yell the loudest, instead of paying people that matter the most? Let us help. By applying aVers Cashflow Guardian methods and procedures, you’ll be amazed at how easy it will become to manage your cash flow.